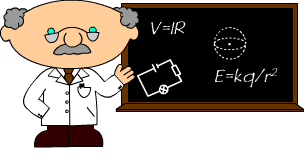 Zeroth law of thermodynamics – If two thermodynamic systems are each in thermal equilibrium with a third, then they are in thermal equilibrium with each other. First law of thermodynamics – Energy can neither be created nor destroyed. It can only change forms. In any process, the total energy of the universe remains the same. For a thermodynamic cycle the net heat supplied to the system equals the net work done by the system. Second law of thermodynamics – The entropy of an isolated system not in equilibrium will tend to increase over time, approaching a maximum value at equilibrium. Third law of thermodynamics – As temperature approaches absolute zero, the entropy of a system approaches a constant minimum. Before I go over these laws in more detail, it will be easier if I first introduce Entropy. Let’s say you have a container of gas molecules. If all the molecules are in one corner then this would be a low entropy state (highly organised). As the particle move out and fill up the rest of the container then the entropy (disorder) increases. 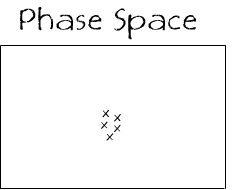 To get a more detailed picture of entropy we need to look at the concept of Phase Space. Some of the concepts for this may be a bit confusing but bear with me, once you’ve got your head round it it’s not that bad. A phase space is just like a graph, but a point on this graph represents the whole state of a system. Let’s use an example. Imagine I have a box with 4 gas particles inside. Each point in the phase space for this system tells you where all 4 balls are located in the box. In our example we are only interested in the positions of the 4 particles, so each point in phase space must contain an x, y, and z co-ordinate for each particle so our phase space is 3N dimensional, where N is the number of particles in the system. So in our case, the phase space is 12 dimensional, in order that each point can describe the location of 4 bodies. In all the diagrams I will depict the phase space as 2D to make it easier to convey what it actually represents. For our purposes we will not need to consider the dimensions. These 5 layouts of the 4 particles, along with the 11 other combinations, make up a set of states that are (apart from the colours) indistinguishable. 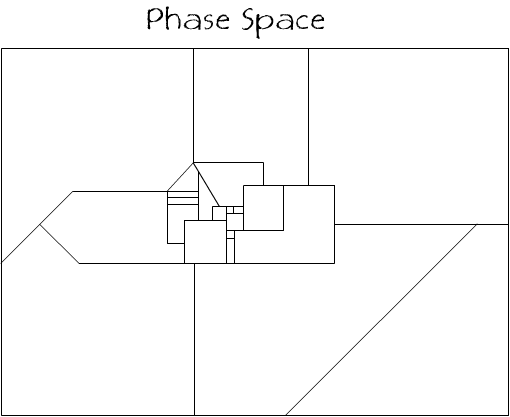 So in the phase space we could put a box around the 16 states that defines all the states inside it as being macroscopically indistinguishable. 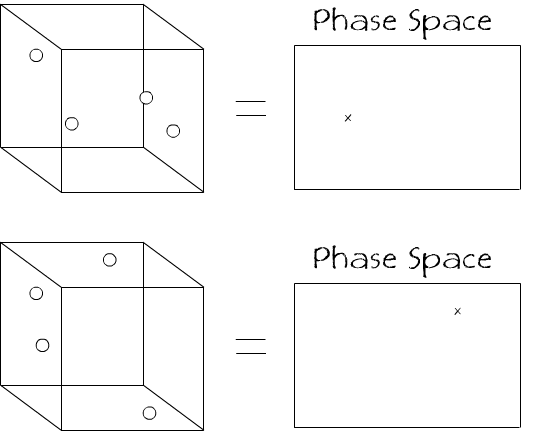 Where is Boltzmann constant ( ) and is the volume of the box in phase space. All the points in a region of phase space have the same entropy, and the value of the entropy is related to the logarithm of the volume (originally Boltzmann never put the constant in the formula as he wasn’t concerned with the units. The insertion of the k seemed to have come first from Planck). Where is the change in entropy, is the energy or heat, and T is the constant temperature. The Zeroth law is so named as it came after the other 3. Laws 1, 2, and 3 had been around for a while before the importance of this law had been fully understood. It turned out that this law was so important and fundamental that it had to go before the other 3, and instead of renaming the already well known 3 laws they called the new one the Zeroth law and stuck it at the front of the list. Basically, if A=B and C=B then A=C. This may seem so obvious that is doesn’t need stating but without this law we couldn’t define temperature and we couldn’t build thermometers. The energy in a system can be converted to heat or work or other things, but you always have the same total that you started with. As an analogy, think of energy as indestructible blocks. If you have 30 blocks, then whatever you do to or with the blocks you will always have 30 of them at the end. You cant destroy them, only move them around or divide them up, but there will always be 30. Sometimes you may loose one or more, but they still have to be taken account of because Energy is Conserved. In other words Entropy either stays the same or gets bigger, the entropy of the universe can never go down. The problem is, this sin’t always true. If you take our example of 4 atoms in a box then all of them being in one corner is a highly ordered system and so will have a low entropy, and then over time they’ll move around become more disordered and increasing the entropy. But there is nothing stopping them all randomly moving back to the corner. It’s incredible unlikely, but not actually impossible. 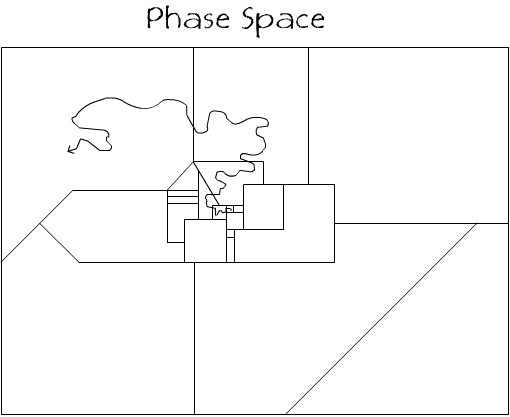 If you look at the problem in terms of phase space you can see that over time it’s more likely you’ll move into a bigger box, which means higher entropy, but there’s no actual barrier stopping you moving back into a smaller box. The value of the entropy is usually 0 at 0K, however there are some cases where there is still a small amount of residual entropy in the system. where = Energy, = mass, = specific heat capacity and = change in temperature. So since the initial temperature of the fork was 20°C, the final temperature of the fork would be 63°C.